Love the penny jar. I’d have to operate it slightly differently; our smallest coin is 5 cents! Years ago We had a tall narrow dimpled jar that appealed to me. I began collecting all our twenty pence coins, It took forty pounds sterling to fill it. I usually put a name on the money. The first jarful was for a set of brushes to clean my chimney. I still have those brushes and use them every year. Jack suggestion was for outdoor extension ladders and they are still good. Elly also had a turn, though I cannot remember offhand what she chose. We collected for years and got to the stage where we would not spend a 20p coin. I might give it a go once more… I still have the jar. It sounds as if you’d found a savings scheme that really worked, and best of all, you used it for things that were good and would last, instead of something ephemeral. Bring back the penny jar! It was ideal for items off our wish lists and we all had our turn. Elly was a dab hand at saying “Dad, I have a 20p, do you want it”? She knew well that old softie would swap it for other coins to the same value! I haven’t seen any coins in a long long time. What I do have is paper money, very short lived. We don’t use our coins on a regular basis. Quarters ($0.25) go in a small container that we take with us for use in laundromats when we travel. The rest of our coins go in a big piggy bank. I keep a small plastic resealing bag with coinage in my bag/purse, suitable for parking meters. Some of our hospital car parks have very high charges for parking! Cool idea! Enjoy your knitting and nattering. I did, Nancy and the banter and laughter did my heart good! This is a great idea! However, since we don’t have that currency here in the states, you’ll have to send me the pounds. If it’s easier, just send the whole 667 at once and I’ll do the daily deposit. 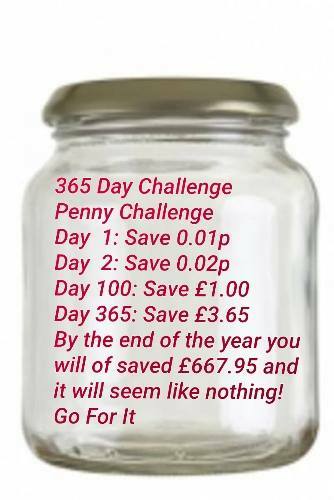 Al, it takes a WHOLE year to save the £667.95, but you will have to come and collect it! Cathy, you could always add smaller coins to the required value for the day. I might go back to the twenty pence jar. WWW, in the recipe for Guinness Bread, in my previous post there was no yeast, but if you think about it in Victorian times, yeast did not come in the form we know it today. They used Brewer’s yeast – from the foam on the top of beer. So perhaps you could try adding yeast. Let me know how you get on, if you try it. Next time I will double the recipw and try freezing some of it. It sounds like an interesting experiment on determination, but not one for everyone. You know, I have not even checked if the tall was correct. We did something like that when we started out, everyone put their change in a big jar at the end of the day. When it got full we got something fun or useful. I like your recipe! The jar works well if everyone is on board. The bread is delicious and on my list for baking this afternoon or tomorrow!